Thiel: $250M in bonds sought for arena: Why? The complete bids for remodeling KeyArena are public, confirming a curious thing: Why did Seattle Partners (AEG) ask for $250 million in municipal bonds, when that wasn’t part of the city’s request? Followers of the Seattle arena saga, be warned: Now that full plans of Oak View Group and Seattle Partners (Anschutz Entertainment Group) are downloadable for public perusal here, dark ski goggles are required because the level of dazzle may cause blindness. The competitors to remodel the fusty matriarch of lower Queen Anne, KeyArena, revealed epic visions rich with imagery of a grand palace for music, sports and general gee-whiz wonderfulness about Seattle. Each proposal is a commercial filled with endorsements for the builders, particularly Seattle Partners. More than 100 companies, agencies, politicians and users sent letters addressed to Mayor Ed Murray singing SP’s virtues, including three NBA and two NHL teams. Also in the mix was Motley Zoo, an animal rescue outfit that provides pets to stars before they go on a stage built or managed by AEG. And here I was worried that all that concert money couldn’t buy rock stars love. The irony behind all the SP endorsements is that many of the projects and events described occurred under the reign of Tim Leiweke, who from 1996 to 2013 was CEO of the entertainment colossus. But a falling out between Leiweke and his boss, Denver billionaire Philip Anschutz, caused Leiweke to strike out on his own and create Oak View Group. While OVG is new and smaller, it appears to have one advantage: Cash and a line of credit. OVG says its $564 million project will have $414 million in cash from its primary owners, entertainment mogul Irving Azoff and James Dolan of Madison Square Garden Co., owner of the NBA Knicks and NHL Rangers. Another $150 million will be a loan from Goldman Sachs investment bank, and some of the rest comes from equity partner Live Nation, a global entertainment company. OVG would pay the city $1 million in rent. The SP bid of $521 million will be funded by $271 million in private cash from AEG and partner Hudson Pacific Properties, a Los Angeles real estate firm with Seattle holdings led by Victor Coleman, who previously had interest in partnering with Hansen in Sodo. 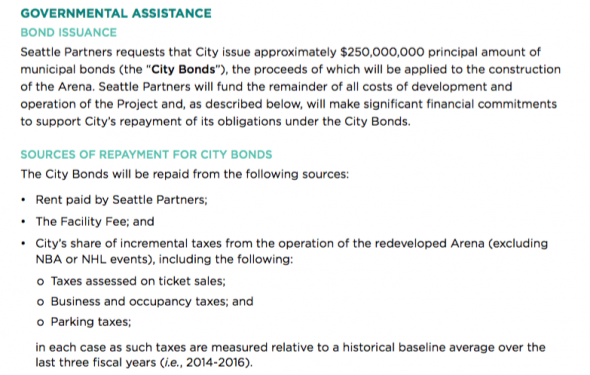 The $250 million remainder is sought from the city via municipal bonds, similar to the $200 million in bonds Chris Hansen sought, then withdrew, for his arena project in Sodo. In its request for proposals, the city said city financial participation was to be “minimal.” The bond request is not minimal. Even though it is not a new tax, nor a re-direction of an old tax, it is a commitment of the city’s bonding capacity that could be used for other projects, thus a city asset. Among the many similarities and differences between the bids, the request for city help stands out. Elsewhere in the bid, SP says it will pay $5 million annually in rent to the city, and an additional anticipated operations surplus of $144 million over the 35-year length of the proposed lease, about $3 million annually. SP also says the savings in financial costs by using the municipal bond’s interest rate, considerably lower than the commercial rate, would save the project $47.8 million. What that means is that SP is asking the city to help in saving $47.8 million up front, in exchange for $7 million more annually in rent and surplus revenues over what OVG proposes over the 35-year life of the lease. I’ll let the finance majors project out the value proposition, although I am curious what a dollar would buy in 2056. The request for public bonds isn’t necessarily a deal-breaker yet from the city’s point of view, according to Brian Surratt, who heads the city’s interest in the project. “We’ll look at it,” he said. But it doesn’t fit the proposal’s specs, even if it does not increase the city’s risk. Certainly, the large and vocal anti-stadium-subsidy crowd in Seattle politics will clear its collective throat on the matter. Some may view the bond request as a non-starter, although that wasn’t mentioned by Murray last week when he issued a statement after reviewing the bids with the principals. “Seattle is in a unique position where multiple developers want to spend hundreds of millions of dollars on a world-class arena in our city,” he wrote. 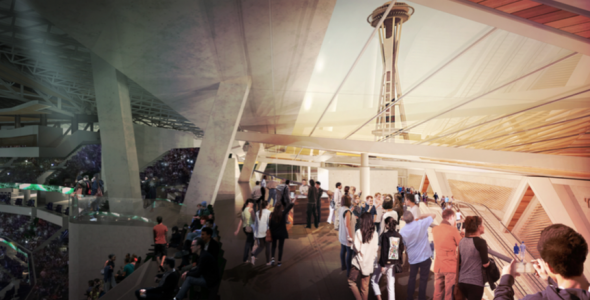 “Last week, I had an initial review of the proposals to redevelop the Seattle Center Arena. I am enthusiastic about both proposals. Happy diggings, Mayor Ed. Just don’t get lost in the dazzle and forget to ask a big question of Seattle Partners: Why did you do it this way? If you don’t ask it, many of your potential voters will. Times are changing. The little fellow carrying the huge stick in Seattle, Hizzoner Eddie Murray, is a wounded chicken. Nothing is going to happen until after the election. At any moment, Sawant may decide to squish him like a bug. Politics are a factor, which is why Murray needs a win. If he saves KeyArena and Seattle Center, it’s a win for him. And he’s committed to decide by June 30. He’s committed to decide on the KeyArena bid winner by June 30. It’s the council that then gets to decide between KeyArena and SoDo. Sounds like they are anticipating that won’t occur until the fall at some point. You have a way with words, Art! Such phrases as “dark ski goggles are required because the level of dazzle may cause blindness,” “the fusty matriarch of lower Queen Anne,” and “general gee-whiz wonderfulness” make me stand in awe of your talent, and as a former Queen Anne resident of long-standing, I am now even more in favor of the SODO plan. Good of you to notice, Buggy. Neither one of these proposals for the Key is primarily about bringing an NBA or NHL team to Seattle. The AEG proposal also asks for a 30 year no compete clause. If an NBA or NHL team felt the remodeled coliseum did not work out financially they could not build their own arena in Seattle. Such may not be legal but then I’m not an attorney. AEG is trying to put a stake in Hansen’s heart. I think until the MOU expires in November, Hansen might have a legal argument. After that, he wouldn’t. Art I wasn’t specifically talking about Hansen. I think a no compete clause would be a restraint of trade and monopolistic. Been some interesting cases along those lines. Of course not. These guys are in the arena business. That said. the costs incurred by OVG in their proposal suggest that getting one or both teams is a large focus (and necessity), even if it’s not their primary motivation. As I said above, what matters is whether an NHL/NBA owner can make the arena work for him without owning or operating the building. Agreed. Although, OVG is saying that they would be willing to make the team(s) full partners/owners in the arena. The question becomes if the three way split is enough for the team owners to be profitable and sustainable. They did say that, but the profit margins for this building because of the construction debt might not be attractive for the team owner, unless he could get first dibs on the calendar. Neither one of these Key arena deals contains any deal to bring the NBA or NHL to town. And yet the mayor cites that as what this is all about. That is deceptive. No deal is possible in an agreement, because the leagues don’t care until they decide to care. They are monopoly operators pitting cities against one another for the leagues’ benefits. Cities are loathe to build on spec. I get that. Right, so the mayor should not be be saying he looks forward to “negotiating the best deal to bring the NBA and the NHL to Seattle.” It’s a mis characterization of the situation. None of the proposals do because they can’t guarantee a team in either league. Right. None of the arena developers can assert in a document that they can/will bring a team. At this stage, what Murray said was aspirational, not a policy or a commitment. He still has the option of saying no to both Key developers. And he should make that point publicly. But if concerts make more money, do you blame the bidders? They’re taking all the risk. In the days when cities used tax money for arenas, they did it to for the national prestige of pro sports. I just think the City Council and Mayor have to recognize they’d look like massive hypocrites for rubber stamping the AEG plan after giving the middle finger to Chris Hansen a year earlier. Because even though KeyArena is a public asset, public bonds are public bonds. If you use public bonds for A, it means less bonding capacity for B. But, I think the City and County will recognize that and that’s why I expect Oak View to win. The problem is it seems pretty evident Oak View’s priority is to turn KeyArena into Sprint Center II where you have concerts, events, college basketball tournaments, preseason games, etc. to make the arena as financially lucrative as possible for them WITHOUT teams. Leiweke may have the CONNECTIONS to bring the Sonics back, but I doubt the WANT-TO will be there (especially if hockey comes first) to be financially accommodating to an NBA and/or NHL owner and that’s the overlooked problem here. Everyone raves about Leiweke’s connections to both leagues and how they’re superior to Hansen’s, but who says he’s going to USE them if the building itself is financially successful without pro sports? Irving Azoff already admitted in the Wall Street Journal that “music is much bigger than sports leagues” as is. The city never middle-fingered Hansen over the public bonds, just the street vacation. If Hansen had won the vacation, citizen groups said they would sue to stop the city’s participation. Leiweke’s view is that it’s the NBA/NHL that choose to stay out of Kansas City, which is true. KC knew from previous failures that it wasn’t high on the list, and has made Sprint Center profitable without a pro sports anchor. Leiweke also knows the NHL wants Seattle, especially ahead of the NBA, so he has to make the building work for the bigger ice sheet. That is the commitment the RFP requires. The question becomes whether an NHL owner thinks he can make enough money without owning the building or controlling its operations, schedule and upgrades. Will the NHL calendar prevail ahead of a more lucrative collection of concerts? That can’t be knowable now. But it’s the call of whoever wants to own a hockey team in Seattle’s busy building. I think you could ask the exact same thing about a potential basketball owner. Would a potential basketball owner want to play in a building they don’t own or control? My guess would be NO and that the building arrangement trumps the market you’re in. Hence why teams move to smaller markets and commissioners try to keep teams in smaller markets (usually for gobs of public money). It’d be a nice building, but I really can’t see any NHL and NBA teams wanting to play there without any ownership or control in the building as much as I’m bullish about the idea of Seattle as a growing market that loves sports. The NBA has been happy with one-horse towns like Portland, SLC, SA and Sactown because they’re easier to extort. But because the NBA sees itself as a global sport, they have less urgency to expand beyond 30 teams because the revs from streaming and other digital products aren’t tied to geography. Seems like the NFL is starting to creep into that kind of thinking too given how much public dollars they got in Las Vegas for the Raiders. Never mind that Vegas is TV market number 40-something. The NFL’s revenues put it in a far higher orbit. They don’t have to do anything but keep their balls properly inflated. Leiweke is offering ownership control. Listen to his interview with Softy at KJR again. Now, to be fair, there is a large gulf between offering and negotiating a deal. I just personally think it’d be easier if you essentially gave custody of the arena to whoever is using it that night for a game or an event. For instance, if you buy a hot dog at a Sonics game, 100% of that money should go to the Sonics. Same with tickets, suites, club seats, loge boxes, arena parking, team store merchandise, etc. From there, you’d also put it in writing that the 3 pro sports teams (Sonics, NHLSeattle, Storm) that’d play in Key, they’d get preferential treatment in terms of scheduling. And basically what you’d more or less have at that point is a viable arena arrangement for the Sonics, NHLSeattle, Storm, AEG/OVG, City of Seattle, etc. on all the nights where it’d be their turn to use the arena. That’d be the concept I’d pitch, at least. Plus, when you think about it, we’re probably far enough along technology wise anyway where you could press one button to decorate the arena for the Sonics and then another button would make it look like an NHL palace or grand concert hall. The issue isn’t game-night operations. The issue is managing the building so it pays the rent, pays the debt, and provides the operator a profit, plus a fund for capital improvements. And that’s why inevitably the 3rd party operator is going to want too much of the money and power over the building and why OVG/AEG isn’t getting us teams. That is the question bidders must answer: How do the annual operations of the building make it attractive to a pro sports owner? Then I guess I’d hope the City requires OVG/AEG to answer that question ahead of time instead of just being obsessed with “saving the clock tower” (thank you Aaron Levine, SOFTY and Back To The Future). Because if you’re going to create an arena at Key where the business model isn’t eventually going to be amenable to pro sports team owners, then us Sonics and NHL enthusiasts may as well just walk to Tukwila or Bellevue and see if one of those sites can work out. I believe he said equity, not control. I would be surprised if Oak View, owing $150M to Goldman Sachs, gave up control. Who at City Hall did Chris Hansen piss off? Everyone? Poor guy. Looks like the fix is in. Yeah. That poor, poor billionaire. No politician is going to like what Hansen got caught doing in Sacramento. And the mayor and some council members have been told that Hansen by himself can’t afford the project or a team. Fair point on Sacramento. Not sure about the finances. Why not combine one of the Seattle Center folks with Hansen at Sodo? It’s the better venue and replaces Balmer’s cash. SP’s plan is D.O.A. One down, one to go, then SODO will shift into high gear. Organized opposition to SoDo popped up almost immediately after Hansen announced his project. Unless I’m missing something, I haven’t seen such against the Key Arena proposals. I wonder why that is? I’m sure more than a few residents would be irate at the potential for 80+ traffic jams during winter sports season, and then there’s the bonding question. I hope the Council reads these Key proposals very carefully. I’m getting a “don’t trust these guys” vibe from AEG and especially Oak View. The Key is already a publicly owned asset that is getting offers from private developers to upgrade it. The Sodo project is private that early on sought public money. Hence the protests. Hansen withdrew his funding request. Location caused the port and the Mariners to complain about Sodo. But the 10 million visitors who see Seattle Center annually are known commodities to LQA residents. But they could protest too once the facts are better understood. I would prefer Hanson’s site and his proposal over either of these from a SPORTS perspective. From a MUSIC perspective, I might actually prefer one of these (most likely the Oak View one based on my understanding of the proposals so far). Kind of curious if there is any “will” in the city to do both a Key Arena renovation AND a 3rd “sports palace” in SODO. Also kind of curious how the Key Arena proposals would change if basketball and hockey were off the table – at least at the professional level. We’ll probably never know but …. I sure am curious. There is some talk of arenas on both sites, but that would be a competition destined to hurt both. And still, neither outfit has managed to correctly address the elephant. People gotta get there, and get home. Good luck. Seattle leadership (Murray & Co.) will probably replace the bonds with a new tax proposal.